Messy play involves children engaging with substances like sand, water, clay, cooked spaghetti, and other things that are gooey or sticky. It’s no surprise that parents tend to avoid these activities. Let’s face it. After work, running errands, making dinner, and doing laundry, the last thing you want to do is clean up a huge mess. But the benefits of getting dirty far outweigh the cleanup process. Young children learn about the world by experiencing it through their senses. You’ve likely seen your baby pick up an object and bring it to her mouth. That is her way of learning about it. Because babies lack the verbal skills to communicate and ask questions, they learn through sight, sound, touch, smell and taste. Sensory play encourages children to experience objects, cultivates a better understanding of the way things work, and is important for brain development. Stimulates sense of touch: introducing your baby to different textures helps develop their sense of touch, which is a precursor to fine motor skills and object identification. Exposure to a broader set of object attributes: playing with sensory materials that exhibit opposite traits (e.g., wet vs. dry, warm vs. cold, shiny vs. dull, smooth vs. rough, messy vs. clean) introduces children to a broad set of characteristics. Talking to your baby while she interacts with these objects can help expand her vocabulary and improve her ability to sort and classify. Increases their appetite for other new sensory experiences: as a child gets used to messy play, she becomes more open to other new sensory experiences, which has multiple benefits. For example, some studies show that allowing fussy eaters to explore and play with their food improves their openness to trying new foods. 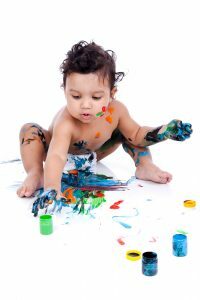 Children as young as 1 month old can benefit from messy play activities. As with any activity, use your own discretion before allowing your child to participate, and always supervise your little one. With a sponge dampened with a scented substance like body lotion, cinnamon, vanilla, breast milk, or formula, softly rub it under her nose, on her forehead, cheeks, chest and the rest of her skin, so that the smell is all over her body. Change the aroma each time you do this exercise. T ie bells or small rattles to the baby’s wrists and let him discover the sounds that he can make by moving his hands. Repeat the exercise but tie the objects to his feet. Dampen a washcloth or sponge with cold water. Gently rub on the baby’s body from head to toe. Then dampen the cloth with warm water and repeat the exercise. Let the baby play in the bathtub. Fill it with different baby-safe substances like water, shaving cream, sand, foam blocks, or plastic balls.